Burlappcar: How about something scary. Maybe I should have waited for Halloween.ut it was just too long of a wait. 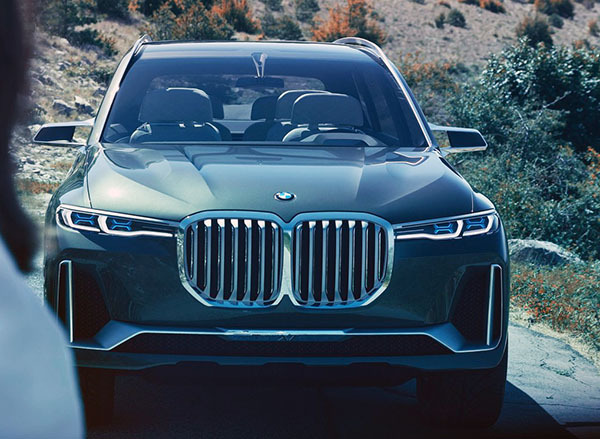 Just saw this among BMW's official pictures of their X7 concept. This has to be the ugliest front end on anything (Including electric razors and Chinese cars) I have seen in a very long time. There is really no excuse for any car maker to be designing crap like this. The front end, the chrome side and the scooped out doors are horrible, but there is a lot of potential there. The interior is nice, the shape of the body is decent. Get rid of the ridiculous oversized grille. Redo the front bumper and fog lights. Remove those chrome side and rear pieces and smooth out the doors and it would be good. I'm sure the production version will learn from the criticism. Has a bit of Edsel in it. Looks a Lexus or Acura front end....totally hideous! It looks like a cartoon pig. Yeh. BMW definitely can't design an XC90. Why they even tried is beyond me. I am sure we will soon get used to it like the hideous Lexus. Uhh, no? The production version has been a done deal for a few years now. The concept has more embellishments than the actual X7, designed until about 2-3 years ago. It really should be so obvious to most "car enthusiasts" by now, if a concept car is of its own origin or based on an already designed production model, impending intro. If BMW showed a concept this year for the next 3-Series (G20), it would not influence nor affect the G20 design, because BMW set a final design for the 2019 3-Series in November 2015. The production looks better than this concept, but you will have to wait a little while for that.